A Phaethon by Noël Coypel for Monsieur ? We had learned of this rather large painting (338 x 200 cm. (ill. 1) through Thierry Bajou who, while at the INHA (2003-2006) had started working on several French paintings of the 17th and 18th centuries, held in non-Germanic countries of Central Europe, an important project which has since been sidelined (see article in French). 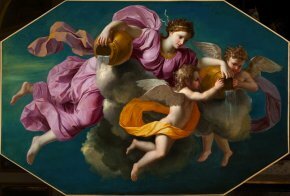 This painting resides at the Art Museum of Jassy [Iasi], in Romania , under an old attribution, still maintained though not without certain reservations , to Eustache Le Sueur. This is understandable since, at first sight, we are undeniably in the presence of a French work, dating probably from the mid-17th century and in a rather light color range which, in certain aspects, evokes Neo-Classical painting. The general identification of the subject, Phaethon Asking Apollo Permission to Drive the Sun Chariot is not a problem : the chariot is visible on the left side of the background, the male figure dressed in blue does indeed seem to be humbly soliciting a favor from Apollo, and several elements (from the Hours of the day harnessing the Sun’s horses to the figure of Winter) echo  a painting of the same subject but with a more complex composition by Poussin held in Berlin (ill. 2). The latter, painted around 1630, was in Paris about 1666, the year it was engraved by Perelle . However, the attribution to Le Sueur which several Romanian authors and historians based on a comparison with the compositions of the Cabinet d’Amour, now seem totally improbable as a certain number of elements point to an important work, and not only due to its format, by Noël Coypel (1628-1707). This confusions appears to be almost excusable as the connections between the two artists, today very distinct, seemed natural to amateurs of the 17th and 18th centuries : in his famous Abrégé de la Vie des peintres, Antoine Joseph Dezallier d’Argenville did not hesitate to write, in speaking of Coypel, that "Le Sueur returned in all his ideas for his compositions ". After an early apprenticeship in Paris under a "fan maker" named Richard Regnet , Noël Coypel received his real artistic training in Orleans with Pierre Poncet and, back in Paris, was noticed in 1646 by Charles Errard while working on Luigi Rossi’s Orfeo, the first opera represented in France on 2 March 1647. For fifteen years, he was to become his main collaborator, transcribing the Master’s style perfectly through his brush , notably at the Louvre, in the first Versailles, or at the Parlement de Bretagne in 1661 , the same year of his Grand May for Notre Dame (today held at the Louvre). This collaboration continued until the completion of the ceiling for the Salle des Machines in the Tuileries, inaugurated in 1662. His reception at the Royal Academy on 31 March 1663 , a first significant element of Le Brun’s patronage which would open the doors of all of the great décors of the new reign, marked the break with Errard. After quickly becoming a professor (1664), he became the Director of the Académie de France in Rome between January 1673 and March 1676 (a short interim period where he replaced his former master) taking with him his son Antoine (1661-1722) who would soon become more famous than his father. During these three years, this institution, as well as Coypel Senior and Junior, would greatly benefit from this stay , notably since he moved the Roman Academy from Salita S. Onofrio to the Palazzo Cafarelli. Back in Paris in April 1676, he continued to climb at the Royal Academy : Counsellor in 1682, Deputy Rector in 1689, Rector in 1690 then appointed Director on 13 August 1695, after Mignard’s death . Housed at the Galeries du Louvre as of January 1673 , Noël Coypel thus devoted, as did many now unfamiliar painters, most of his production to the décor of the royal residences (Tuilieries, Versailles and Trianon). Later, he would also work at Invalides, Gobelins , and Meudon for the Grand Dauphin, even after Louvois had succeeded Colbert and Jules Hardouin-Mansart preferred La Fosse to him, notably for the post of Director at the Académie Royale where he was replaced in April 1699 . Antoine Schnapper, who was active in bringing the artist back to light , points out another paradox : Noël Coypel collaborated extensively  in the first campaign of paintings commissioned for the Trianon (1688-1693) although he belonged to an "intermediate" generation, placed between the great elders such as Mignard, Le Sueur, Le Brun and this "Trianon Generation" represented by La Fosse, Jouvenet, Houasse and the Boullognes . 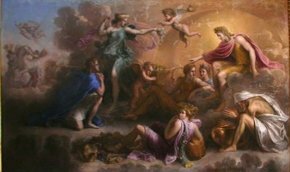 Noël Coypel who, either due to personal choice or in order to continue living from his art, devoted himself later in life  to the Church, died in Paris, on 24 December 1707, and was buried the next day at the church of Saint Germain l’Auxerrois. The Phaethon held in Iasi illustrates the two main elements pointed out by Antoine Schnapper when attempting to summarize the characteristics of Noël Coypel’s style. Thus, we find this tendency on the part of French artists at the time against "the strict application of the laws of perspective, [and] against the systematic foreshortenings which destroy the proportions of the human body ". This rejection of illusionism is even more pronounced in Coypel by a monumentality which is at times close to a certain harshness, even when treating feminine figures, as we can see, for example, in the ceilings of the Palais du Parlement in Rennes. It would be downplayed later at the Tuileries (ill. 3) then at Versailles while still preserving, in the large formats, a "sculptural solidity in the forms". Although, in this painting, the vigor of the figures seems to have been attenuated, the negatives showing the former state of the canvas (ill. 4) - and confirming its probable period of execution - leads us to think that this impression is a result of later restorations. Besides the emphatic treatment of the muscles and the hands, this Phaethon reveals two other elements which are characteristic of Noël Coypel. First of all, there are the draperies with long, tight folds but seemingly blown by the wind, which he uses quite often for the secondary figures in his works  (besides the Allegory of the Earth from the Tuileries (Lyon, MBA), we would include the example of the Victory crowning one of the two Apollos at the Louvre) as well. There is also the use of a palette blending soft and metallic shades, in the same work. 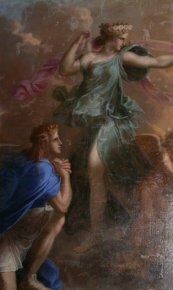 The acid pink and almost "peppermint" green can be found, for example, at Versailles, in the modello for the ceiling (never carried out) for the Salon de Saturne. Unlike Errard (the examples at the Hôtel Cathelan and, perhaps, the Hôtel Bouthilier or the Hôtel Poussepin), Noël Coypel apparently never worked on private décors, but his productions for the royal residences are not always documented in detail. This is particularly true for those in the mid-1660’s, probably the date of execution of this Phaethon, notably at the Tuileries where changes of mind may have taken place and not only in the formats . However, we are in the dark particularly as concerns his work ("several paintings") for the décor of the Grand cabinet du Roi (which then became a Salon de Compagnie then Salle des Gardes) in the Palais Royal, the residence of Gaston and Philippe d’Orleans, the uncle and brother of Louis XIV, later that of the Regent . Given the later references which evoke a Sunrise possibly painted for the ceiling in this room , the princely symbolism generally associated with Apollo and the - costly - use of lapis lazuli for Phaethon’s cloak, we would be tempted, submitting it as a theory, to situate the initial location of the Phaethon from Iasi in this room. In fact, a possible interpretation of this subject (obtaining one of his symbols of power from the King) would certainly not have displeased Gaston d’Orleans who often undertook daring entreprises which he soon abandoned. Iasi, Muzeul de Arta, Inv. MI 9. Bequest of Scarlat Varnav, before January 1855, date of an Inventory of paintings and lithographs at the Academy Library in Iasi, where the painting is mentioned. We should point out that MI 10 is a Diana in the Clouds (70 x 104 cm. ), a fragment of a décor which was also attributed for a long time to Le Sueur after being donated by Ioan Aivas in 1866. We express our thanks to Calin Demetrescu, Lia Voicu, director of the Museum of History and Archeology Prahova and Elisabeta Savu, curator of the Ploesti Museum for their help and they documents they provided. The initial caution ("attributed to Le Sueur") of F. Panaiteanu-Bardasare (1816-1900), an artist who founded, in October 1860, the Academy of Fine Arts and the city’s Art gallery, was once again adopted more recently by Caludiu Paradais, author of the museum’s latest catalogue (1972). He underscores the differences with the décor of the Hôtel Lambert and quotes the opinion (with a photograph) of Jacques Foucart : "this painting is not a work by Le Sueur" (cf. Valori ale picturii universale in Muzeul de arta din Iasi, Iasi, 1972, cat. 62, pp. 163-169, with illustrations). 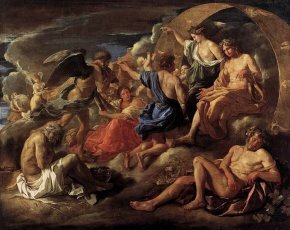 Although they stand closer to each other in Poussin’s work, there are obvious similarities with the main group formed by Phaethon (dressed in blue in both cases), Flora seemingly about to execute a dance step in his welcome (dressed in olive green and white in Poussin and peppermint green in Coypel) and Apollo (obviously dressed in bronze yellow) whose pink coat in Coypel is almost reflected in the orange drapery of Summer which Poussin places lower down. Poussin’s painting, measuring 125.1 x 155.7 cm., is probably the one which the painter-art dealer, Jean-Michel Picart presented, for an opinion, to the Académie Royale on 30 June 1674 (cf. 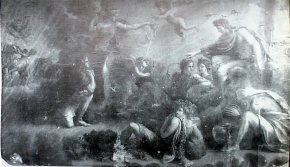 Procès Verbaux de l’Académie Royale de Peinture et de Sculpture 1648-1793 [ed. A. de Montaiglon], Paris, 10 vol. 1875-1892 ; t. II, p. 29, and the catalogue of the exhibition Nicolas Poussin 1594-1665 [dir. Pierre Rosenberg], Paris, 1994, cat. 39, pp. 195 (rep.) -196). Cf. Abrégé de la Vie des plus Fameux Peintres, Paris, 1745, IInd part, p. 325. We would like to point out, in the collegiate church of Saint Quiriace in Provins, a painting (listed as a historical monument) supposedly illustrating a scene (The Ressucitated Youth ?) from the life of Saint Anthony of Padua, which repeats elements from the Mays in our two painters, with a stronger influence by Le Sueur perhaps in the faces, but with no idea as to the identity of the artist (who obviously represented himself on the left). Our discovery of this apprentice contract strangely made its way into the entries on this artist, with no acknowledgement by the author, in the catalogue for the exhibition Les Maîtres retrouvés, Orléans, 2002. We all are familiar with Guillet de Saint-Georges’ remark on the décors at the Louvre : "All of the paintings are by M. Coipel who, simply on M. Errard’s thoughts, made all the studies" (cf. Mémoires inédits sur la vie et les ouvrages des membres de l’Académie Royale de Peinture et de Sculpture [ed. Louis Dussieux, Eudoxe Soulié, Philippe de Chennevières, Anatole de Montaiglon and Paul Mantz], 2 vol., Paris, 1854 [reedited, Geneva, 1968], t. I, pp. 79-80, quoted by A. Schnapper, "Noël Coypel et le Grand décor peint des années 1660", Antologia de Belle Arti, n°1, 1974, pp. 7-17, here p. 8). The canvases to be maroufled, were sent to Paris and installed in the spring of 1662 (cf. A. Schnapper, Ibid., p. 9 and, more recently, the publication commemorating the restoration of these décors after the fire of 1992 : Philippe Bonnet, François Coulon, Pierre Curie et al., Palais du Parlement de Bretagne. Les peintures restaurées, Rennes, 1998). He had first submitted his name on 6 September 1659 but could not carry out the various required stages for his reception. Like several other artists, decorators or future decorators of royal residences, he was to benefit from the appointments announced in the spring of 1663 (cf. Procès-verbaux..., op. cit., t. I, p. 159 and p. 219, on 31 March). He would successfully exhibit there the four compositions, on the theme of royal justice, commissioned for the King’s apartment in Versailles : Ptolemy Philadelphus Liberating the Jews, Alexandre Severus Overseeing the Distribution of Wheat during a Famine, Trajan Meting Justice and Solon Explaining the Laws (today moved up to the Queen’s Salle des Gardes) and his son would take part in the Drawing contest at the Académie de Saint-Luc (cf. the first pages of Nicole Garnier’s monograph, Antoine Coypel 1661-1722, Paris, 1989). cf. Procès-verbaux..., op. cit., t. II, p. 212 ; t. III, p. 10, p. 42, and p. 167. The "brevet" is dated 5 January (cf. A. N., O1 17, fol. 1 vo). He supplied the drawings for the famous tapestry of The Triumphs of the Gods woven as of 1687 (cf., the latest reference, Xavier Salmon, Le Triomphe de Venus. Un carton de tapisserie redécouvert, Dijon, 2011). Cf. the Procès-verbaux..., Ibid., t. III, p. 257, on the date of 7 April. Hardouin-Mansart would also manage to have the payments for the Trianon made only in 1711, four years after Coypel’s death. Cf. "Peinture classique tardive à Trianon", Il Mito del Classicismo nel Seicento, [ed. S. Bottari] Messina-Firenze, 1964, pp. 211-225, "Noel Coype et le grand décor...", op. cit., and Tableaux pour le Trianon de Marbre, Paris, 1967. "[At Trianon], the only one who could rival Houasse and Verdier in number of paintings was Noël Coypel, that is the oldest and most traditional of all the other painters" (cf. A. Schnapper, "Peinture classique tardive...", op. cit., p. 217). For this residence, Coypel produced eleven paintings, Verdier and Houasse sixteen each. Although reflecting his stylistic evolution, when Noël Coypel exhibited these reduced versions of the four paintings done in Rome for the King’s Apartment in Versailles at the Salons of 1699 and 1704, A. Schnapper points out the challenge represented by "this tribute the artist pays to Poussin, Le Brun, his own youth, at the very moment of the arrival at the Surintendance of Hardouin-Mansart implying the end of his official career" (cf. Tableaux pour le Trianon de Marbre, [updated edition by N. Milovanovic, Paris, 2010], p. 62). A. Schnapper, "Noël Coypel...", Ibid. In the same article, A. Schnapper sees this as a means for Coypel to cover a part of the canvas. In fact, at the end of the 17th century, Nicolas Bailly, in an attempt to write out an inventory, did not even recognize the subjects of some of the compositions which Noël Coypel had painted for the Petit Appartement Haut du Roi (cf. the report by Nicolas Sainte Fare-Garnot, Le décor des Tuilieries sous le régne de Louis XIV, Notes et documents des musées de France, 20, Paris, 1988, pp. 82-85). We know that Antoine Coypel, appointed Peintre ordinaire de Monsieur, frère du Roi, on 22 January 1685, had close ties to the latter’s son, the future Regent, who would commission him notably to do the décor, alas now lost, of the Galerie d’Enée in this same Palais Royal, later Palais d’Orleans, produced between 1703 and 1706 (cf. N. Garnier, Antoine Coypel..., op. cit.). The subject is suggested by A.-J. Dezaillier d’Argenville in 1745, in the first edition of his Abrégé. He points out first that of the "several paintings" by Noël Coypel at the Palais Royal, "there remains only one piece in the middle of the ceiling" before giving its title and adding that it is on canvas (cf. Abrégé ..., op. cit., p. 325 and p. 328). But this reference (and probably this vestige) had already disappeared at the time of the (extended) edition of 1762.